When you need to add real brass to your project for that "just so" feel, nothing less than the real thing will do. Artificial sounds and less-than-authentic details will sabotage even the best-intentioned efforts. It's like a history buff watching a movie about World War I and seeing a 1960's-era clock on the fireplace mantel in the background. The credibility is shot and the production is ruined. You only get one chance. Don't blow it. That's the seriousness with which we took the creation of Orchestral Companion Brass. 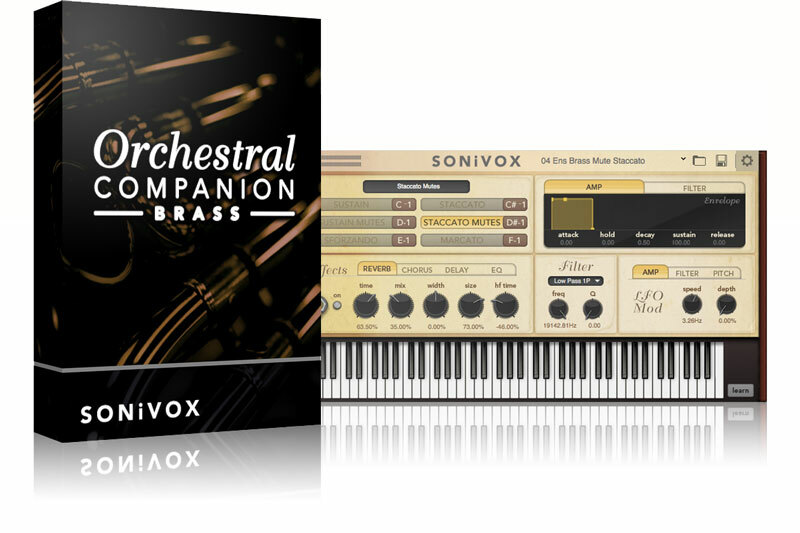 The SONiVOX design team has produced over 80 outstanding brass programs, each one meticulously crafted to deliver as accurate and convincing an experience as possible. That's what you demand, so that’s what we did. There is a comprehensive collection of full orchestral brass ensembles, and also a full array of smaller brass sub-groups. 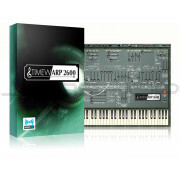 In addition, we provide you with a complete selection of solo instruments. All the major instruments are here, including solo trumpets, trombones, bass trombones, French horns, and tuba. Double and flutter tonguing, sustained and staccato notes, plus instrument mutes, swells, sforzando, and marcato voicing provide you with the depth of content you need for convincing brass parts and tracks. All because we knew you wouldn't accept inauthentic brass sounds in your production any more than you'd accept a 1960's clock in your 1914-era movie. We recorded the Orchestral Companion Brass in the legendary Futura Productions studios in Massachusetts. Members of the Boston Pops and/or Boston Ballet Orchestras played all performances, with the same premium instruments they use for their actual concert galas and events. A combination of spot and ambient mic’ing capture every instrumental nuance, while preserving the refined acoustics and intimacy of the performance space itself. Under the expert guidance of SONiVOX musical sound connoisseur Jennifer Hruska, each sample session was faithfully recorded by Emmy award-winning engineers Antonio Oliart and RIAA award-winning engineer John Bono. The players were positioned using orchestrally-correct seating, and measures were even taken to compensate for the sound-absorption of any players absent on that particular day. In order to retain a realistic "organic" feel, we used absolutely minimal post-recording electronic processing. We used two B&K 4011 microphones to preserve the highly-desired front-of-hall sound (you know, the "good seats"), while superior-grade spot mics accurately captured each instrument's individual detail. Benchmark-caliber preamps fed Troisi Octal A/D convertors to complete an uncorrupted signal chain. We expended more effort and care on this system than most crazed get-a-life audiophiles do on their own systems, but that’s how important it was to us...because that's how important it is to you. 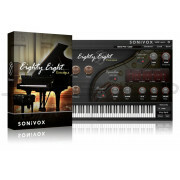 Each patch and preset is easily playable by virtually every level of performer. All instruments are presented in multi-velocity layers, with natural swells available via the modulation wheel. MIDI key switching provides on-the-fly articulation for select patches. The internal sound engine provides additional modulation (LFO) sources, dynamic envelope control, and studio-grade reverb/effects to allow creative customization of the onboard sounds. 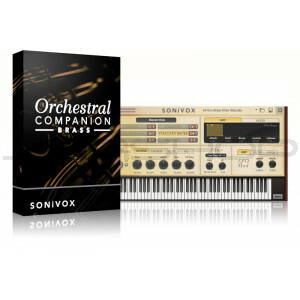 In addition, Orchestral Companion Brass runs as a fully compatible plug-in with any VST (32 or 64 bit), AU (64 bit) , and AAX (32 or 64 bit) for ProTools 10.3 or higher Digital Audio Workstation (DAW) software.